Do you teach in an historic preservation/heritage conservation program? How do you know you’re doing it well? If you teach in an historic preservation or built heritage conservation program in a college or university, you may be aware that there are very few publications that directly address the pedagogical, curricular, and assessment needs of the field, especially from an international perspective. In fact, I would argue that until recently, there was no unified book on the subject at all. Back in 2012, I led the organization of an international conference focusing on postsecondary education for historic preservation/built heritage conservation. 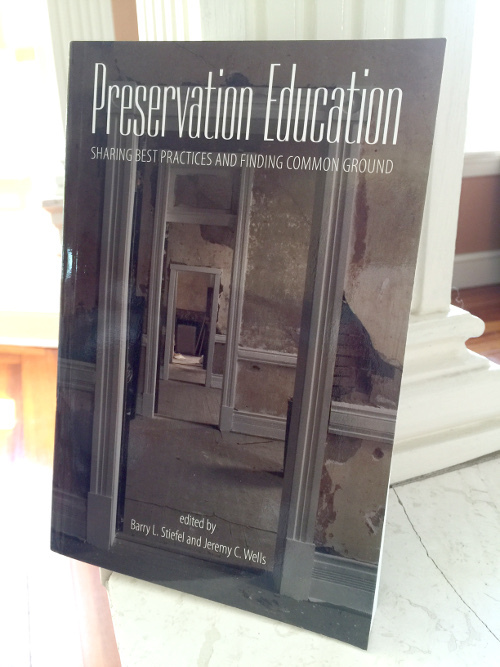 The result was a book of selected papers that I co-edited with Barry Stiefel, titled Preservation Education: Sharing Best Practices and Finding Common Ground, published in late 2014 by the University Press of New England. I am often asked about the content of the book, and although selected sections are available on Google Books, I thought it would be useful to describe it in more detail here as it should be required reading by all faculty (full and part-time) who teach in historic preservation or built heritage conservation programs in many parts of the world. This is an international volume with authors from the United States, Brazil, Sweden, the United Kingdom, Israel, and Australia. Although I and my co-editor are from the United States, we were careful to make sure that the representation was as international as possible and not US-centric. There is no agreement across academics and practitioners as to what defines historic preservation/built heritage conservation as a discipline; many terms are not consistent across national boundaries, which further complicates the issue. The relationship between employment and job skills is largely unknown. We need to work much harder at communication, collaboration, and bridging across disciplinary boundaries; conflict is an inevitable part of practice. We have significant ethical and quality issues in the field that are not being addressed. There is very little available guidance on curriculum design. There is very little guidance/scholarship on outcomes and assessment methods (student learning outcomes) for the field. We offer some recommendations to these issues, especially in terms of building bridges between allied disciplines and working more extensively with our international colleagues. The bulk of the book addresses the positioning of postsecondary conservation/preservation programs at the undergraduate and graduate level, the relevance of the liberal arts, pedagogical techniques, where the future of preservation/conservation education should be heading, program evaluation, curriculum development, and case studies on specific courses. I’ve attempted to summarize individual chapters, below. This is a review of the literature on primary, secondary, and postsecondary heritage conservation education. Basic terminology and outcomes-based learning approaches are addressed. Very little literature, grounded in the conservation of the historic environment, exists on these topics and few people/organizations seem interested in exploring them further, which is why the Preservation Education book (and the associated conference) is needed. This paper explores the relationship of the liberal arts with professional education. Using a case study of work in museums and internships, the author presents a “blended” approach of hands-on training with the liberal arts. The conclusion is that this mix works well because it allows students to apply what they’ve learned and make liberal arts concepts more concrete. The author looks at the relationship between undergraduate and graduate historic preservation education and cautions about the dangers in becoming too vocational in focus, especially at graduate level. The content in graduate and undergraduate programs is often strikingly similar and there is no clear path on why and how to make them different. The author places a particular emphasis on the need for students to have good writing skills to be effective in the professional workplace. The author discusses the tension between “thinking” (traditional college degree programs) and “doing” (apprenticeship/vocational training). The author advocates for an integration of “thinking” and “doing” in graduate degree programs through curricula that allow students to understand and engage in the creation/conservation of the tangible fabric of heritage. Games can be an effective learning tool, but are challenging to design in a way that meets pedagogical goals while still being fun to play. The author addresses this challenge to developing a board game to teach historic preservation planning concepts. Students were engaged in testing and refining the board game and, in the process, became much more engaged than would typically be expected with this kind of planning material. Early results indicate that a board game can be an effective way to teach material that results in greater participation and long-term retention. As the preservation/conservation field matures, there are significant challenges in defining what is and is not heritage and who gets to decide. The field is moving from a positivist/material focus to a postmodern/meaning construct while trying to balance between traditional and new knowledge. The author stresses the importance of a conservation ethic because science alone cannot determine what and how to conserve. Practitioners need to focus on more effective communication skills to connect with and understand communities. Educational curricula need to address these issues/concepts. The authors undertake an ethnographic assessment of the outcomes and overall success of six conservation training centers located in five historic cities in northeastern Brazil. The results indicate a disconnect between the outcomes of these training efforts and the needs of local communities. The authors conclude that the use of an ethnography is particularly effective for educational outcomes assessments because of the focus on more “realistic” results coupled with a much deeper understanding of the issues involved. This is a case study of the integrated conservation program at the University of Gothenburg, which has traditionally used a model that focuses on expert knowledge, communication, and critical reflection with a balance between building restoration and urban and land use planning contexts. The challenges that the program is currently addressing is related to the contemporary “shift from physical preservation toward cultural heritage” which demands a greater focus on identifying and communicating with stakeholders and negotiating difficult issues with these stakeholders. It is difficult to recreate these situations in the classroom. This paper describes a holistic, interdisciplinary training program based on defining common ground between relevant disciplines, using a common language, and creating a mutual code of conduct between participants. The program combines theory with hands-on activities. Historic cities are used as labs by engaging students with “real heritage conservation projects” in a curriculum that balances the tangible/intangible and economic/social aspects of practice. Traditional built heritage conservation curricula need to be expanded to address the significance of place and heritage values. Students should learn about inclusive visioning, project management, leadership, “breakthrough thinking/brokerage”, team building and creating partnerships, working with constraints, and process/change management. Distance/online learning needs to be “blended” to give students an opportunity for hands-on, field experience. A case study of Empire State College’s Advanced Certificate in Public History and its approach to education outside a normal classroom experience. The program is based on distance learning and extensive community engagement. The authors indicate that this community engagement approach is central to their successful teaching efforts. The authors address how to teach historic preservation within a traditional architectural design studio. In a case studies based on the architecture programs at Cal Poly Pamona and the University of Illinois, the studios successfully integrate social and oral history, preservation advocacy and ethics, and “accurate building documentation”. The authors discuss the challenges of creating a curriculum that addresses the conservation of modern architecture predicated on an understanding of “community demands, stakeholders’ aims [and] the intricate process according to which decisions are made.” The authors present a case study that successfully integrates a focus on modern architecture, “a better process for involving users and communities”, increasing dialog between professionals, and balancing theory and practice. The authors advocate for students to learn “prudence and sensibility” in their work. The authors make a case for the need to integrate an historic preservation curriculum within interior design programs because of the relevancy of preservation/conservation to the field of practice. The authors describe a survey of students from five interior design programs in order to understand to what extent these students are aware of historic preservation and if they have an interest in learning about the subject. The results indicated that while students were confused about the nature of historic preservation, there was a strong interest in the subject. The authors conclude that the need to teach historic preservation in interior design programs can be most easily met by incorporating this topic in a design studio. This is an empirical study that surveyed students and alumni from graduate real estate education programs. The results strongly support the need for real estate curricula to incorporate historic preservation courses. More than 80% of the respondents wanted core preservation courses as part of real estate curricula, with coverage of tax credits, adaptive use, preservation economics, and an introductory course being particularly important. More than half of the respondents wanted to work on adaptive use development projects with historic buildings. Within higher education, there is a lack of understanding about the nature of a graduate thesis and its similarities and differences to a capstone (or concluding/applied) project. The author defines the essential characteristics of an empirical thesis, which is designed to answer a research question via the collection and analysis of data. In contrast, capstone projects are descriptive and often mirror the format of reports used in professional practice. The acquisition of data using social science methodologies (e.g., ethnographies, surveys, qualitative case studies) is a novel approach for the historic preservation thesis, but is necessary in order for students to answer questions related to the human aspects of heritage conservation practice. The challenge is in adapting existing social science research methodologies and methods for use in an applied context where all data collection and analysis must happen (ideally) in a single semester, which privileges the use of qualitative case studies, survey research, content analysis, and nonparticipant observation within an ethnographic frame. This paper critiques the dominant Western European approach to educating students and suggests that educational methods outside of this domain not only have value, but particular relevance to heritage conservation education. The authors present a case study of the Jewish havruta method used in rabbinical seminaries as a pedagogical tool for teaching preservation law. The havruta method, which is based on study groups presenting material to each other, proved to be particularly adept in helping students understand the diverse cultural perspectives of issues that are not well defined. Bookmark this article Do you teach in an historic preservation/heritage conservation program? How do you know you’re doing it well?